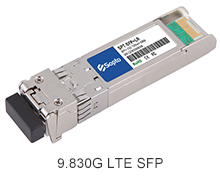 Sopto can provide good quality and competitive price for CPRI LTE SFP transceivers and got very good feedback from main customers. LTE (Long Term Evolution) is the project name of a new high performance air interface for cellular mobile communication systems. It is the last step toward the 4th generation (4G) of radio technologies designed to increase the capacity and speed of mobile telephone networks. Where the current generation of mobile telecommunication networks are collectively known as 3G (for "third generation"), LTE is marketed as 4G. For the CPRI application, the rates are 9.830 Gb/s, 7.373Gb/s, 6.144 Gb/s, 4.915 Gb/s, 2.458 Gb/s, 1.229 Gb/s, 0.614Gb/s. Sopto can also provide the related passive products like CPRI cables together with CPRI LTE Tranceivers. The Common Public Radio Interface (CPRI) standard defines the interface of base stations between the Radio Equipment Controllers (REC) in the standard, to local or remote radio units, known as Radio Equipment (RE). The companies working to define the specification include Ericsson AB, Huawei , NEC, Alcatel Lucent and Nokia Siemens Networks GmbH & Co. KG. OBSAI, which stands for "Open Base Station Architecture Initiative", is an initiative created by Hyundai, LGE, Nokia, Samsung and ZTE in September 2002 with the aim of creating an open market for cellular base stations. The idea behind this initiative was that an open market would substantially reduce the development effort and costs traditionally associated with creating new base station product ranges. LTE, an initialism of long-term evolution, marketed as 4G LTE, is a standard for wireless communication of high-speed data for mobile phones and data terminals. It is based on the GSM/EDGE and UMTS/HSPA network technologies, increasing the capacity and speed using a different radio interface together with core network improvements. All Sopto’s LTE optical transceivers are compatible with Huawei, ZTE and Alcatel wireless base station equipment well, like BBU or RRU equipment. If you want to know more about the exact information of the specified transceiver, please contact us.